I’m dreaming of a white Christmas. I’ll have to settle for green. I am in no way in the Christmas spirit. That isn’t to say I’m not happy or filled with the spirit of giving, but it’s not in the traditional way. Thais are aware of Christmas in the same way Americans are aware of Chinese New Year. They know it exists and looks like fun, but they don’t celebrate it in any way. There are no Christmas decorations or trees to be found anywhere. Well, there was a tree at the shopping mall in Korat (see photo). I biked home the other day singing “It’s Beginning to Look a Lot Like Christmas” and laughing to myself as I looked at coconut trees and rice fields. I will sincerely miss Christmas Day at my family’s house in Forest Lake. It’s always enjoyable. Merry Christmas to all my friends and family back in the states. I miss you all. Consider this my Christmas card for the year. 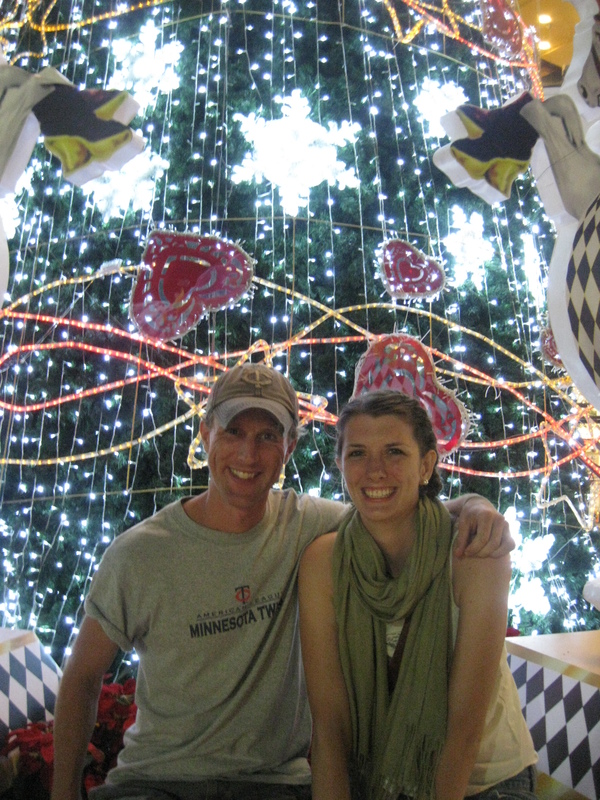 This entry was posted in Peace Corps and tagged christmas, peace corps, thailand by Jeff Jackson. Bookmark the permalink. I can sort of relate. I spend the holiday back home in LA where it was 80 degrees on Christmas Day. Sort of hard to be in the spirit. But, I can’t say I didn’t enjoy the reprieve from the bitter cold here (yet, still almost no snow). Best wishes on your 2012.